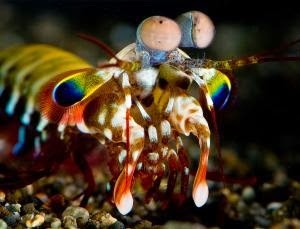 Mantis shrimp see the world in a way like no other. Their bug-like eyes are equipped with a unique vision system, which discriminates between colours using a method never seen before. Like many animals, humans have three kinds of photoreceptors in their eyes, each sensitive to a different colour. When we see a colour, our brains determine what it is by comparing how much the three photoreceptors respond.